THE INTERNATIONAL AND SUNDAY TIMES BESTSELLER; All leaders are constrained by geography. Their choices are limited by mountains, rivers, seas and concrete. Yes, to understand world events you need to understand people, ideas and movements…but if you don’t know geography, you’ll never have the full picture. ; To understand Putin’s actions, for example, it is essential to consider that, to be a world power, Russia must have a navy. And if its ports freeze for six months each year then it must have access to a warm water port – hence, the annexation of Crimea was the only option for Putin. To understand the Middle East, it is crucial to know that geography is the reason why countries have logically been shaped as they are – and this is why invented countries (e.g. Syria, Iraq, Libya) will not survive as nation states. 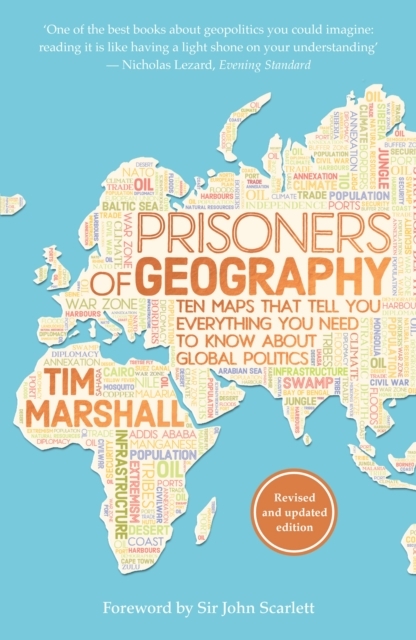 ;Spread over ten chapters (covering Russia; China; the USA; Latin America; the Middle East; Africa; India and Pakistan; Europe; Japan and Korea; and Greenland and the Arctic), using maps, essays and occasionally the personal experiences of the widely travelled author, Prisoners of Geography looks at the past, present and future to offer an essential guide to one of the major determining factors in world history.